moira ratchford - We all need to be reminded of the small miracles in life. That's why I paint. moira ratchford - We all need to be reminded of the small miracles in life. That's why I paint. We all need to be reminded of the small miracles in life. That's why I paint. The prints can be plain, or matted and framed, ready to hang in your home or office. 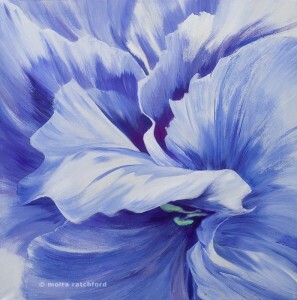 It’s an affordable way to add a bit of beauty to your walls! This entry was posted in Artwork on November 28, 2017 by moira. 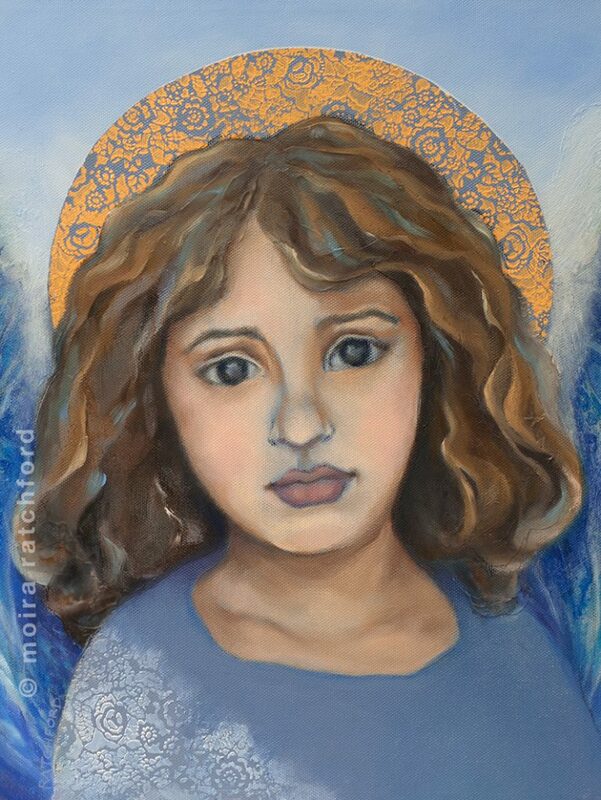 This angel was inspired by a young Syrian refugee who had fled the violence. Her eyes revealed all that she had seen, and she had a wisdom beyond her years. 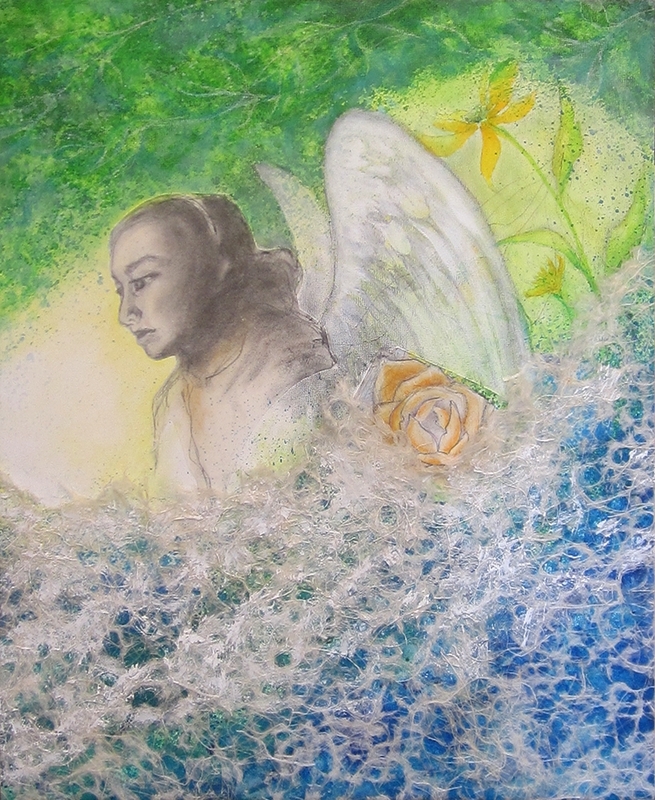 The angel of conscience helps us discern the truth, so that we can see clearly and act courageously. This entry was posted in Artwork on August 18, 2017 by moira. I recently took my charcoal sketch of the Syrian refugee girl and weaved a larger composition around her, using Ogura lace paper, pastel pencils, acrylic ink, and oil pastels. I imagined her as an angel, looking down on the world she had left. What would she see? What might she be thinking? What would she say, if she could counsel the humans below? Take a moment to think on these things. Put yourself in her place. The voices from the graves of Syrians who have perished during this brutal war are pleading with us to stop and consider these questions. This entry was posted in Artwork on August 27, 2016 by moira. This entry was posted in About the Artist, Artwork on July 24, 2016 by moira. This entry was posted in Artwork on May 21, 2016 by moira. The great glaciers of the world are shrinking. The ice they shed is cascading into the oceans, upsetting the saline balances, coastal water lines, and temperature differentials, all at once, for the first time in thousands upon thousands of years. “Glacier, Retreating” portrays this process of disintegration, the gradual melting and receding of the front edge of these glaciers. 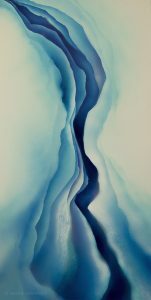 I chose airbrush and ink as my medium because they best convey the subtleties of the gradual melting and diffusion of the glacier’s core into the surrounding atmosphere. Once the great glaciers disappear, they may never come back. 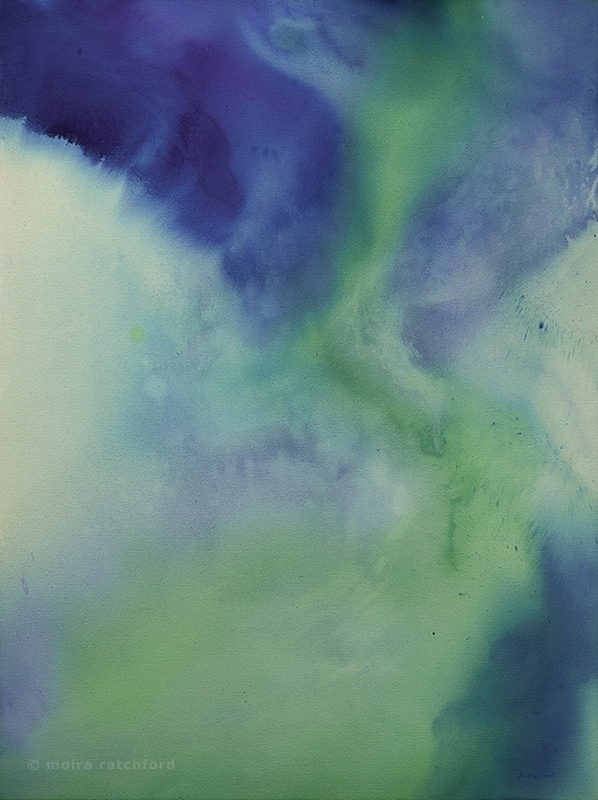 “Glacier, Retreating” is a memorial to their existence, in its muted layers of blue and green slowly dissipating to the edges of the canvas, the last glimmer of ice crystals still intact, but not for long. This entry was posted in Artwork on May 7, 2016 by moira. In reflecting upon themes for my Climate Change series, the image of melting glaciers immediately came to mind. Blue is a key element in my palette, my favorite in fact, and the prospect of exploring all the different shades of blue inherent in melting ice was irresistible. Glacial crevasses are particularly breathtaking, with their multitude of polished layers reflecting the blue light and plunging deep into the unknown. 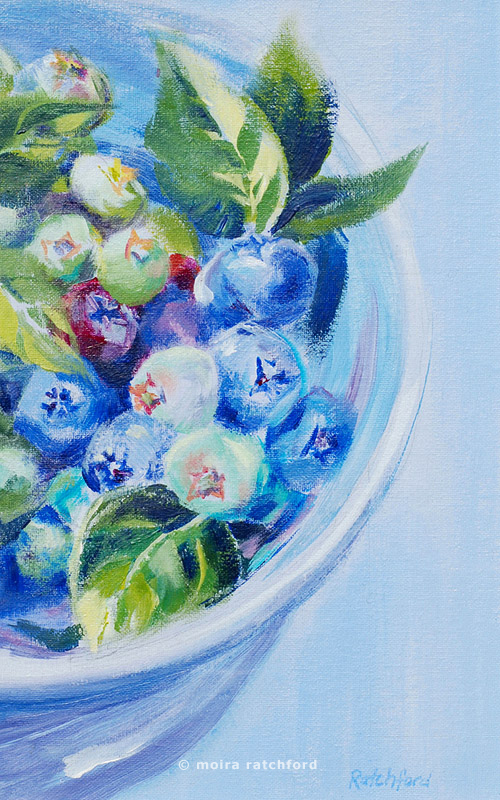 I had just begun experimenting with airbrush, and a crevasse was the perfect subject for rendering the overlapping shapes and softly curving hues. The purity and translucency of color achieved with airbrush is unparalleled, and it conveys the delicate, fragile nature of these constantly changing ice formations. This entry was posted in Artwork on April 21, 2016 by moira. Will we be over our heads with sea level rise? One of the techniques I have experimented with recently is poured acrylic ink on raw canvas. Morris Louis was probably the artist best known for pioneering this. For my series on Climate Change, poured ink is the perfect medium to convey the feel of sea level rise, as the ink drenches the canvas and creates waves and eddies of color, as if swirls of ocean water were engulfing the viewer. To achieve this effect, you have to first treat the canvas with a liquid that breaks down the sizing and allows the ink to sink into the fabric. Then you have to work quickly to achieve the best effect, pouring and tilting, brushing huge swashes of ink and letting one bleed into another, spattering alcohol across the surface like sea foam. The beauty of this kind of piece is in its spontaneity and simplicity: just pure ink flowing on raw canvas, no lines drawn except those naturally created as one color combines with another. As you pour and tilt and drag the brush across the surface, a completely organic form takes shape, a serendipitous blend of pure colors, much like the sea itself. This entry was posted in Artwork on April 12, 2016 by moira. Our earth is our only home in this vast universe, and it’s in deep trouble. If we don’t act quickly to reduce our carbon emissions, our children and grandchildren will end up paying the price for our negligence. 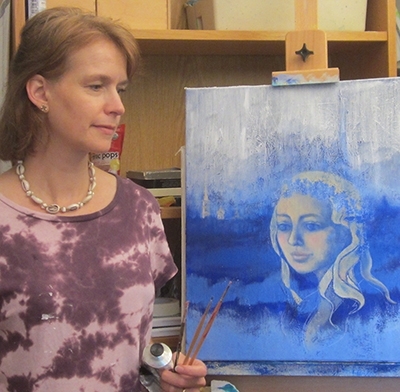 I recently began a series of paintings on the theme of climate change. 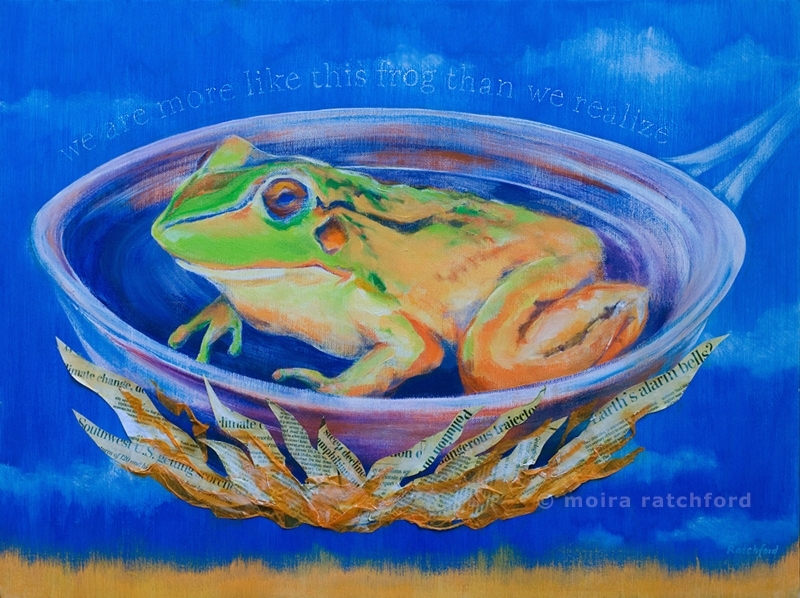 My first painting in this series illustrates the proverbial “frog in the frying pan” concept. This is the idea that if a frog is in a pan of water and you raise the temperature slowly enough, the frog won’t notice it and will end up perishing. Alarming news headlines on climate change make up the collage of flames under the frog. While this hypothesis was eventually disproven in the case of frogs, it underscores a key psychological phenomenon that has kept humans from responding more vigorously, even as temperatures rise and the early consequences of climate change have become increasingly obvious. Daniel Gilbert, a psychology professor at Harvard, notes that our brains are ill-equipped to deal with distant or future threats. So, the frog in the frying pan analogy is not so far off. One only wonders how hot it will have to get before we mobilize the massive efforts that will be needed to change the path of climate change, and preserve a livable planet for future generations. This entry was posted in Artwork on April 6, 2016 by moira. 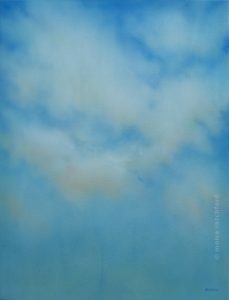 One of his photos inspired me to create the painting shown below. 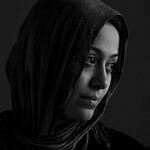 It is of a Syrian mother who at the time was in a refugee transit camp in Bulgaria. I don’t know what happened to her. But I do know that his photo forever captured her serene beauty and sincere dignity in spite of her circumstances and surroundings. just another refugee fleeing the violence. 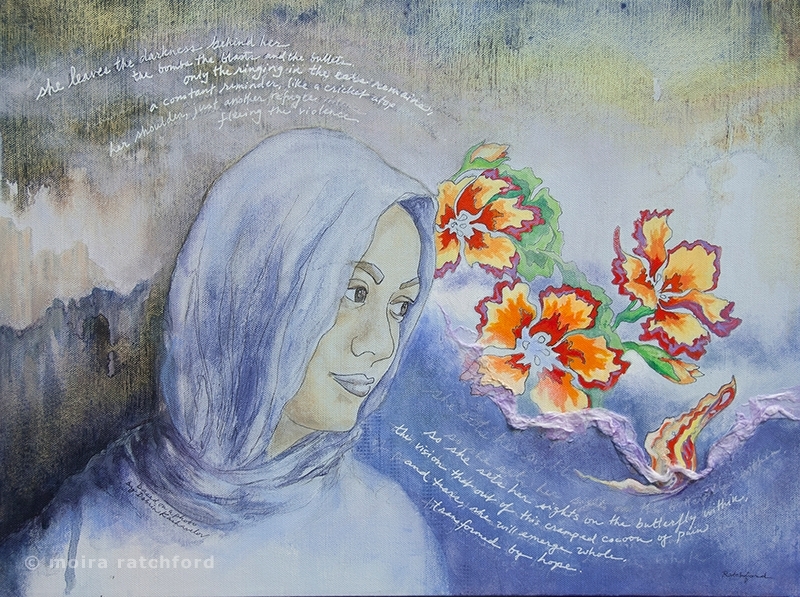 Again, as in my painting, “Their Ghosts Will Judge Us…”, flowers still bloom amid the destruction. 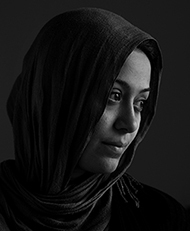 As a refugee of war, this young woman tries to turn her back to the horrible things she has witnessed, to put them behind her and to focus on the promise of her future life. 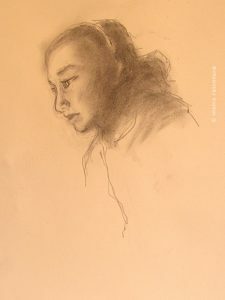 In Syria, she was huddled in basements during bomb attacks, then squeezed into an airless truck driven by smugglers, and now, in the transit camp, she is again hemmed in, surrounded by walls, waiting for who knows how long, to have a sense of her fate. She is like a butterfly that has been confined to a cocoon, unable to stretch, unable to see the light, unable to take wing. In a cocoon, accompanied by the painful memories and the ringing in the ears, the unseen scars of surviving the barbarism of war. But my hope is that, like a butterfly, she will soon break free, and be drawn to the flowers that bloom around her: the kindness of strangers, the basic normalcy of being just a young woman again, and the possibilities that will be opened up to her in her new life. This entry was posted in Artwork on February 24, 2016 by moira.